For some years 60 Springs provided opportunities that inspire young people to develop innovative solutions towards a sustainable Taranaki. The programme's three themes were sustainability, education and creativity. 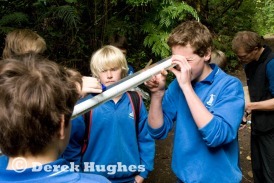 60 Springs was administered by Puke Ariki Education and funded in partnership with Shell Exploration NZ Ltd and the Taranaki Regional Council. Freshwater crayfish in Pukekura Park, March 2009.